I have fallen in love with a new children's picture book. It's Tatiara, written and illustrated by Jo Oliver, and published by New Frontier (2010). healing comes to each of them. I like the way our young heroine is so matter-of-fact about her physical disability - a curved spine, for which she wears a back brace. She longs to swim with her injured seal friend, Tatiara, but she must make do with a bathtub instead. It doesn't stop her catching fish for Tatiara, even though the seal pup is perfectly capable of catching them herself. Oliver's illustrations are created by dry-point etching coloured with vibrant watercolour washes in the colours of the sea. (New Frontier) What this means to me is each picture is evocative, rather than photorealistic. They give a very special "feel" to the book , transporting us to its setting in Tathra, on the far south coast of NSW. The illustrations in sepia tones seem to show old interior walls with water stains. You can see so much light and spray in the rolling waves of the seascape as Oliver captures the essence of ocean. And the dry-point etching enables delighful fine detail. Setting is a real feature of Tatiara, with not just the physical features of the local area being incorporated into the story, but also historical details. The young narrator shows us glimpses of Tathra's past, when cargo was loaded from steamers onto the wharf, and whalers would come to harpoon whales. 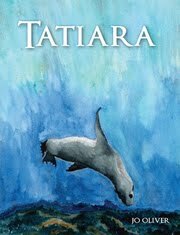 According to the publisher's guidelines, Tatiara is suitable for children with a reading age of 4-8 years, but I urge you to consider it for older children too. I think it is a perfect acquisition for libraries, and homes that appreciate beautiful books. The story and words are simple enough for young children to share, but have an ageless quality. It's the sort of book you close with a sigh, and that stays with you for a very long time. I loved Tatiara too. Her books are so different from anything else around at the moment. I also thought her first picture book Pilgrim was excellent. I wish I'd stressed that point in my review, Rebecca! You're right, and that's an important point. You know, you are not doing very well for my bank account showing me all these great books!!! Oh btw, got the Monster Maddie books... Thank you! So long as your kids don't go hungry - I figure books feed their hearts!